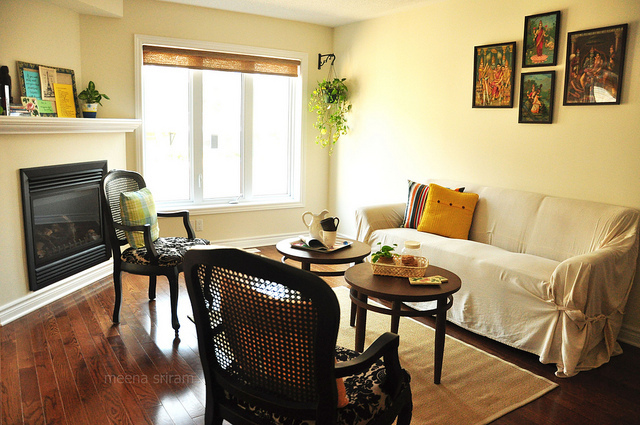 Today Rang Decor Reader Meena Sriram shares few creative corners of her 1700 sq.ft town home in Ottawa, Canada. Meena explains, 'I wanted to create a light- filled home that is serene, relaxing, with an airy breezy feel and lots of punchs of colour'. She has used a lot of different natural textures to bring a homey feel, sisal rugs, bamboo blinds, a lot of old art prints carefully handpicked from antique stores in Chettinad, reframed and hung in groups. 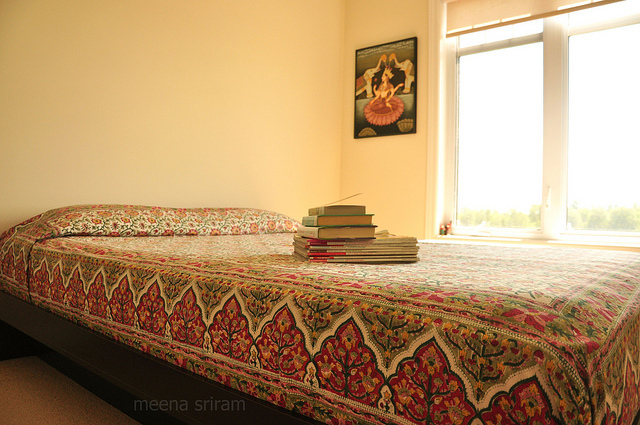 Meena feels homes don’t have to be perfect but they should be original and personal. 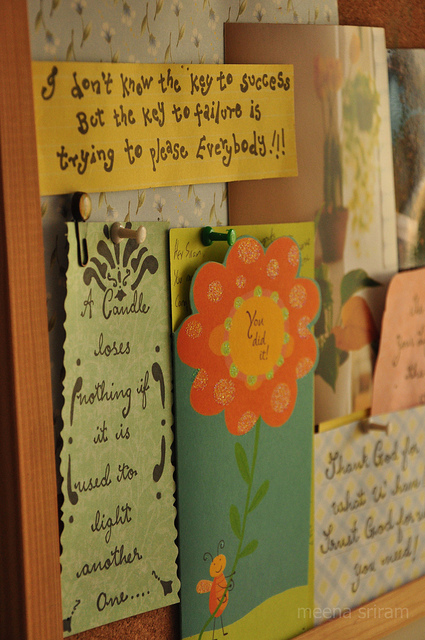 She loves inspirational quotes, and blackboards, so they're all over her place. She has a thing for old world charm, so she has tried incorporating plenty of vintage and flea market finds. She believes it is important to always choose things that are meaningful to you as opposed to what is trendy at the moment and feels you don’t need to have a lot of money to create a beautiful home, just a little creativity, quirkiness and adding that personal touch makes it your own! I agree, your lovely home is proof of that. 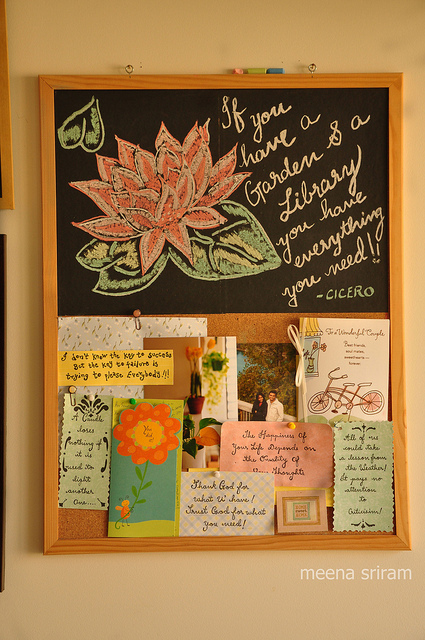 Thanks for sharing few corners of your home with readers of Rang Decor. If you have any questions for Meena do ask in the comments section. Thank you. a lovely , calm and comfy home.visually soothing and very homey.loved all the quotes Meena has used.They are so very true. Great to see another home tour. The light is beautiful and I love all the fabrics...the yellow cushion covers, the curtains in the dining room, the bold seat upholstery in the living room and the charming runner/napkin with the cups. 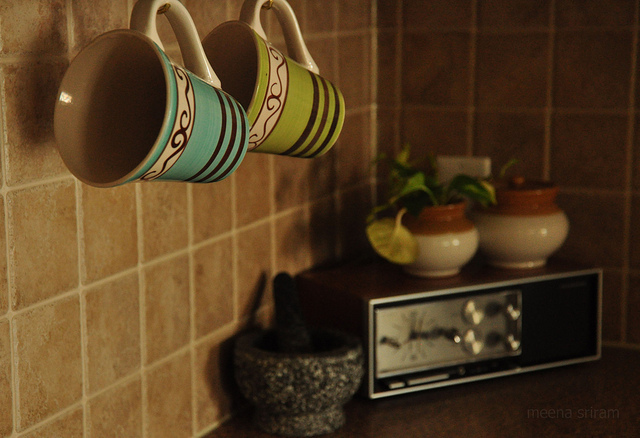 Always enjoyed Meera's photos on flickr and it's great to see her home featured here. And, I totally agree about the emphasis not on looking perfect but having a personal and original feel! Love to see a home with breathing space. 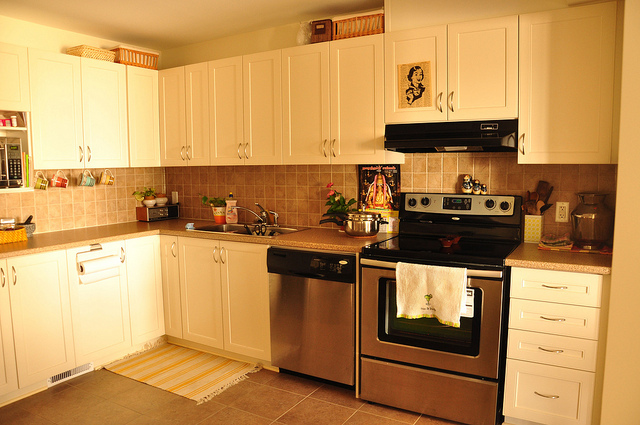 Love the clean uncluttered look and the charm that shines through. 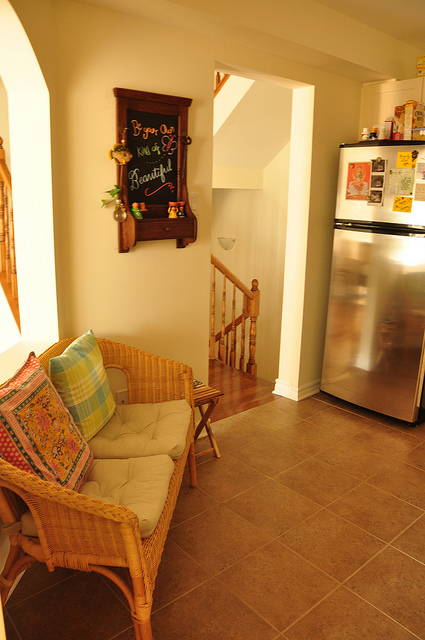 love the vintage verma prints and so much light in an apartment in ottawa! wow!!! beautiful, serene, well organized home. I loved bedspread in guest room and quote in dining room chalkboard- those two are my favorite things. i was so happily surprised to see the vintage art prints and the pickle jars:) i have the same ones too. that chalk board is great. thanks for the visual treat. was happily surprised to see the vintage art prints and the pickle jars. thanks for the visual treat! cosy and very homely ambience...love the place. The radio in the kitchen takes the cake. Lovely pictures! I've been going through your blog since many years now. Love the inspirational quotes ! Love the blackboards..and i have a weakness for pickle jars..hard to get them where I live..
a lovely home. love the simple details! such a lovely and beautiful home !!! Thanks for getting it to us. Hi Meena! I love your home. 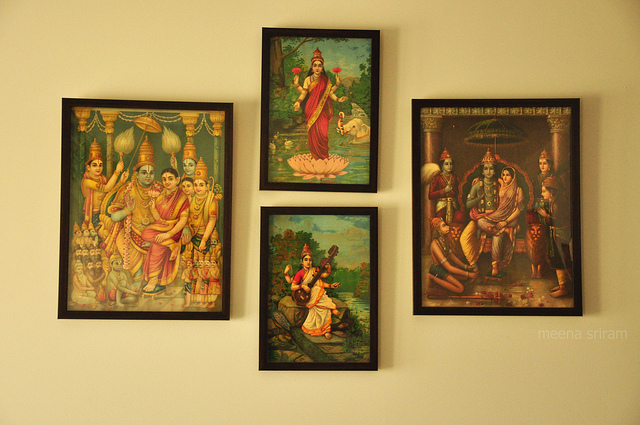 I live in Ottawa as well and LOVE ravi varma prints.. I have a few but not as nicely arranged as you! Let me know if you would like to meet up sometime..
Love your space Meena! That cluster of framed calender prints looks wonderful! Beautiful home tour. Different arrangement of vintage religious prints...it fits perfectly with the clutter free, artistic, vintage influenced decor. I want I want I WANT! Ah. I have fallen in love with this home. 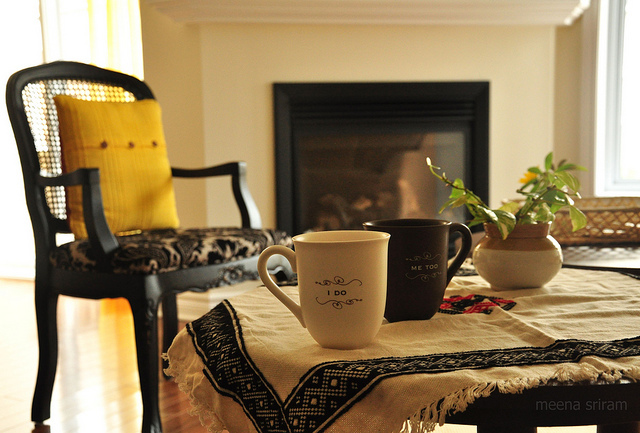 Lovely pictures..
Lovely,bright and cozy home...loved the photographs Meena shared here. Wow, so beautiful and simple as against staged, artificial decor. Kudos Meena! Loved the idea of the Steel pot for water on the kitchen counter. It adds so much more character to the house....I personally love converting household things no longer needed to something that adds utility. The pickle jar converted to pot holders was a great idea.I have some old traditional rice measures (in brass) as pot holders since most o us are used to cup measures now. Such a serene and beautiful space. Love the way Meena has placed color accents like the green money plants and the yellow cushions. Gorgeous! Lovely home! The first thing I am doing when I get home today is to put a plant into my empty pickle jar! 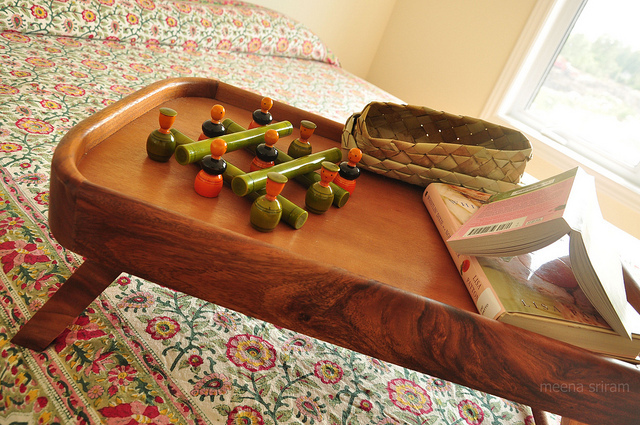 Love your home...It is really calm and homely..Where did you buy the bed spreads...those are very colorful.